Four Southern California men, allegedly part of an extremist white supremacist group, have been charged by federal prosecutors for violent attacks on counter-protesters, journalists and a police officer at political rallies across the state. Three of the four are in custody. The New York Times reports that Robert Rundo, 28 was taken into custody on Sunday at the Los Angeles International Airport after fleeing to Central America earlier this month. Robert Boman, 25, and Tyler Laube, 22, were arrested Wednesday morning. Authorities are searching for the fourth man — Aaron Eason, 38. The criminal complaint, filed by the FBI out of Los Angeles on Saturday and unsealed on Wednesday, alleges the four are part of the white supremacist Rise Above Movement. RAM subscribes to a virulently racist, anti-Semitic ideology and trains its members in combat. The group “represents itself publicly as a combat-ready, militant group of a new nationalist white supremacy/identity movement,” the complaint says. “The allegations describe an orchestrated effort to squelch free speech as members of the conspiracy traveled to multiple locations to attack those who hold different views,” said U.S. attorney Nick Hanna in a news release. Videos recorded by journalists, bystanders and surveillance cameras, as well as posts on the internet from the group’s members and private social media communications between them, helped the Department of Justice build its case. The DOJ alleges the four men violated federal conspiracy and riot statutes in a series of incidents from March to June of 2017. At a “Make America Great Again” rally in Huntington Beach in March, the DOJ said in its criminal complaint, members of RAM attacked two journalists and a number of counter-protesters. Video footage shows Laube punched one journalist three times in the face, after the reporter was jostled by other rally attendees and stumbled backwards. The Daily Stormer — a neo-Nazi website and online community — praised the violence. “Front page of the stormer we did it fam,” one RAM member texted another. 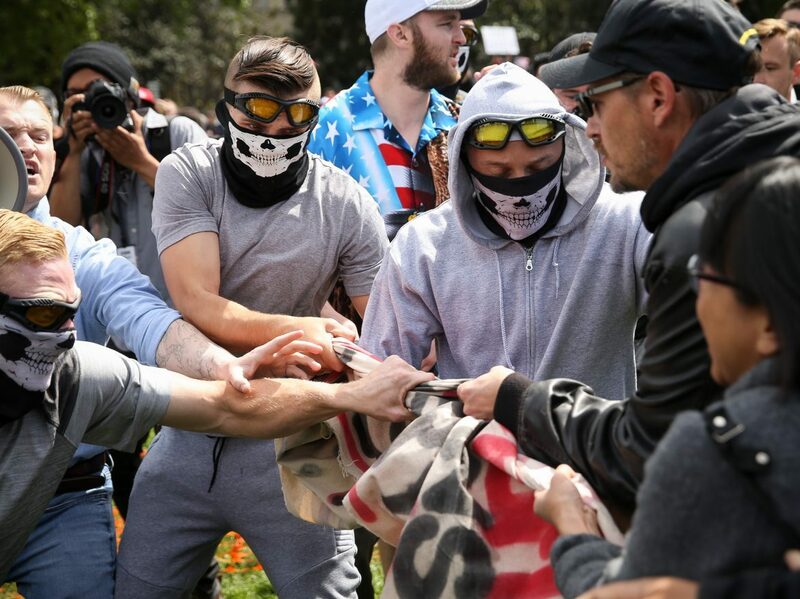 In the weeks after the attacks, members allegedly gleefully celebrated the attacks and recruited others to attend an upcoming rally in Berkeley, as well as a training session in hand-to-hand combat before the gathering. At that April rally, Rundo, Boman and Easaon assaulted people at the rally. Videos show group members with taped hands — like boxers — punching counter-protesters. In one attack, a RAM member held down a counter-protester while another landed punches. Rundo was arrested for punching a “defenseless person” and a police officer. “Total Aryan victory,” a RAM member texted another member the next day. RAM members again celebrated their assaults, according to the complaint. They posted photos of members holding up a banner celebrating they stole from counter-protesters. On social media, Boman posted several photos of himself attacking others and of RAM members engaged in combat training. In June, the white supremacists attended an “Anti-Islamic Law” rally in San Bernardino, where they carried out more attacks. Three RAM members not indicted in this case were arrested. Wednesday’s charges follows the arrests earlier this month of another four RAM members — Benjamin Daley, Michael Miselis, Thomas Gillen and Cole White — who were charged on conspiracy to riot charges for attacking counter-protesters during last year’s Unite The Right rally in Charlottesville, Va. The California charges describe connections between both sets of defendants. Between April and August of 2017, the complaint alleges RAM members “engaged in regular combat training sessions” before attending the Unite the Right rally. They also “used the internet to coordinate combat training in preparation for the events, to arrange travel to the events, to coordinate attendance at the events, and to celebrate their acts of violence in order to recruit members for future events,” the complaint said. Members documented their extremist ideology in public internet posts, including their affinity of the “14 words” — “a mantra known and used by white supremacy extremists and neo-Nazis,” FBI special agent Scott Bierwirth said in the complaint. Also according to the California affidavit, Rundo and two men charged in the Charlottesville case flew to Europe last spring to celebrate Adolf Hitler’s birthday. There, they met with other white supremacy extremist groups.